Scooching thru an American history magazine....the other day...i came across this fun piece on W H Taft, who came from the FF neck of the woods, and seemed thoroughly larger than life in stature and humour, much as us Knights of the KMSA try to be. William Howard Taft was born in Cincinnati, Ohio on September 15, 1857. He was his predecessors most trusted advisor. Whenever a situation became too difficult for lesser men to handle, it was Taft who was sent to "sit on the lid." Taft's Vice President was James S. Sherman from 1909-1912. From 1912-1913 he did not have a Vice President. "Big Bill" was the heaviest president over 332 pounds and 6'2". He struggled all his adult life with a weight problem. He got stuck in the White House bathtub and needing a big bathtub, he had a 7' long 41" wide tub installed that could accommodate 4 normal-sized men. He was the first president to own a car at the White House (he had the White House stables converted into a 4-car garage), to throw out the first ball to begin the professional baseball season, and the first president to be buried in the National Cemetery in Arlington, Virginia. Arizona became a state on February 14, 1912. Making Taft the first President of 48 states. Taft liked milk so much that he brought his own cow to the White House. The cows name was Mooly Wolly. Mooly was replaced by another cow called Paulin. Paulin was the last cow to graze on the White House lawn. Taft had no military experience and there were no wars fought during his term. During his administration, the U.S. parcel post system began, and Congress approved the 16th Amendment, providing for the levying of an income tax. He was well known for his humour and his laughter. "It was by all odds the most infectious chuckle in the history of politics. It started with a silent trembling of Taft's ample stomach. The next sign was a pause in the reading of his speech, and the spread of a slow grin across his face. Then came a kind of gulp which seemed to escape without his being aware that the climax was near. Laughter followed hard on the chuckle itself, and the audience invariable joined in." He died on March 8, 1930 in Washington, D.C, He was 72 years and 174 days old, and was the first President to be buried in the National Cemetery in Arlington, Va. The only other President buried there is President Kennedy. I am not in favor of suffrage for women until I can be convinced that all the women desire it; and when they desire it I am in favor of giving it. Taft was the first President to be buried in the National Cemetery in Arlington, Va. The only other President buried there is President Kennedy. Kennedy's grave is famous for the eternal flame. Taft, on the other hand, has a lesser known (but equally impressive)eternal bathtub. It is a full-size replica of Taft's tub with faucet on full blast, yet never filling. Taft liked milk so much that he brought his own cow to the White House. Paulin was the last cow to graze on the White House lawn." Of course, that's accurate only if you don't count Hillary! 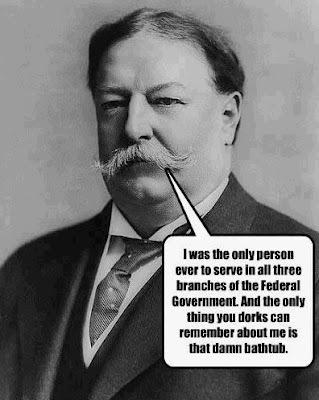 Taft was not daft...but he could produce a very big draft in his bath tub. We almost had another cow grazing on the White House lawn...Palin, too close to Paulin for my comfort!